Slack is a fantastic tool that helps strengthen internal communication for more than 60,000 teams on a daily basis. The app gives any team the ability to chat, share images, PDFs, spreadsheets and search through archived conversations. The best part? Teams have access to vital information on any device or platform, whenever they need it. Since good communication is important for business, you can see why it’s an extremely valuable tool for many teams. At Guru, we spend a great deal of time talking to some of those teams that are regularly leveraging Slack, sales teams in particular. And after many conversations, we’ve come to this conclusion: Slack is down right awesome when it comes to internal communication for your sales team...but it’s a whole different ball game when you’re trying to use it to help your sales team close more deals. The truth is your team is creating tons of valuable knowledge in Slack everyday through organic conversations, but how do you find the signal amongst the ever-increasing noise of your Slack channels? The key distinction here is the need for speed and accuracy when reps are trying to close a sale. To work efficiently, (or in other words - close more deals and make more money) sales reps need accessible, reusable, and easily consumable information that exist within their workflow, and they need to be able to find it fast. Your team is increasingly spending more of their time in Slack as the average user spends typically 2 hours and 20 minutes per day actively using in Slack. Sales teams are constantly chatting and sharing information with each other over Slack channels every day, but aren’t fully reaping all the benefits it has to offer. This may sound simple, but keeping a #Sales channel for just your sales team is important, especially if you want to keep the conversation on topic. If your team is large enough, perhaps it will make sense to create team specific channels, but remember the trade-off with more channels is more noise and distractions for your team. Just like face-to-face conversations, it’s so easy to get off topic in chat. One thing leads to another and soon you’re chatting about last week’s sales conference or a big deal that someone closed. Try to resist the urge to post irrelevent material in your #Sales channel. It creates too much noise and distraction. Instead, do that in other designated channels, such as a #Random channel. For example, at Guru, we have a #Money channel that everyone in the company is on that is solely dedicated to celebrating our wins. It’s a great morale boost whenever the channel lights up (not just for our sales team), and an easy way to ensure our celebrations don’t distract from our topical discussions in #Sales. Integrations are the perfect way to customize Slack based on your team's specific needs. Keen.IO wrote a post demonstrating how their sales team uses Slack to make it easier for reps to stay in their workflow. 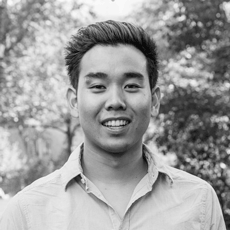 They used Clearbit’s API, for tasks such as prospecting both companies and individuals directly in Slack. “We realized we needed a way to aid our sales and customer success workflows on Slack, so we built a tool that lets people type a command that looks like this: /company slack.com. This has been incredibly useful for our Sales and Customer Success teams when they need to look up information about a new signup or an existing customer.” Read more here. At Guru we do something similar as Keen.io. We use an integration that allows our sales team to see every sign up for our product (in our #newteam channel) and directly reach out to those that are in our ICP. Like I mentioned earlier, having dedicated & focused channels for each team can help reduce the noise but often times we can’t resist. Chat is so ingrained in our habits, there are always bound to be irrelevant conversations and gifs that quickly add to the noise of each channel. Essentially, that means Slack can become time consuming and an inefficient means for distributing sales information for long term consumption. While in real-time your team may be able to find and reference information you share, a few weeks or months later it will be much harder to find. 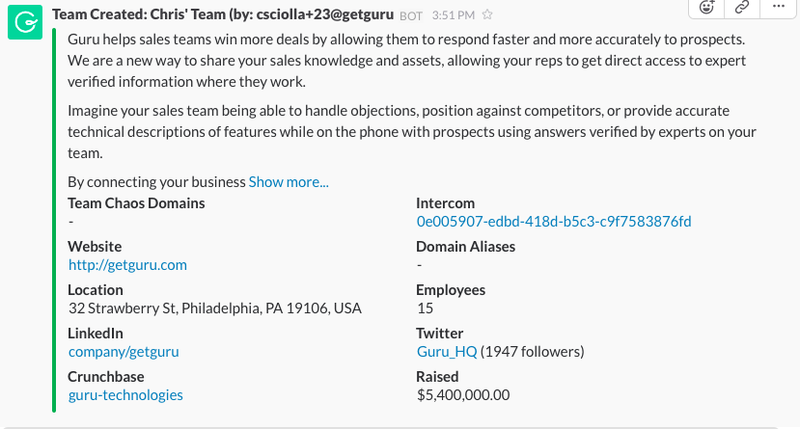 Our Guru bot allows your team to capture organic sales knowledge that is created in slack for reuse and search for relevant information right in slack and post it to one of your channels. With our bot, now your sales team can cut through the noise in Slack, find the sales knowledge they need quickly and get back to what really matters...closing deals. Does your sales team use Slack in any interesting ways? We’d love to hear the what works for you and your team. Let us know here in the comments or over on Twitter.